What’s up with the Salmonella recall of Ritz crackers and Goldfish? I am baffled by food safety issues related to the recent recall of Ritz Crackers and Goldfish by their manufacturers, Mondelēz and Campbell/Pepperidge, respectively. I understand how their whey protein ingredient could be contaminated by Salmonella. Whey is an excellent growth medium for bacteria. What I don’t understand is how people eating Ritz Crackers or Goldfish could become ill with Salmonella (the New York Times reports two cases of illness). Aren’t crackers baked? Isn’t that a kill step? I can understand why Mondelēz would issue a recall as a precautionary measure. But can someone please explain to me how Ritz Crackers or Goldfish could contain live Salmonella from whey baked into them? I am not the only one puzzled by this. BakeryAndSnacks.com quotes Stewart Eton, an industry food safety official, who emphasizes that baked goods undergo a kill step. This would ordinarily be a CCP [Critical Control Point] under their HACCP [hazard analysis and control plan] program with the process validated and verified at regular intervals. Under the FSMA [FDA’s food safety laws], for example, this risk-based rationale would be deemed sound and would not require a recall. A reader writes that flavoring agents are sprayed on to Goldfish after they are baked. If this is true, Goldfish would be make in the same way as dry pet foods and would not be sterile. All foodborne illness outbreaks are devastating for victims but fascinating for investigators, since each is different. This investigation has traced the illness-causing Salmonella to one kind of papaya (Maridol, under Caribeña, Cavi, and Valery brands) to one Mexican farm (Carica de Campeche). If you are interested in the legal implications, check Bill Marler’s website. I’m fascinated by reports of Chipotle’s ongoing problems with foodborne illness. The main interest of the press in these episodes is their effect on Chipotle’s stock prices. The outbreaks have been linked to a bunch of different pathogens: E. coli O157:H7, E. coli STEC O26, Salmonella, norovirus, and, possibly, hepatitis A. This means they are due to different causes at different outlets. The food, foods, or individuals responsible for these outbreaks are uncertain, making them hard to know how to prevent. The most recent CDC report (December 21) counts 53 cases of E. coli 026 from 9 states, with 20 hospitalizations. The FDA reports (December 22) that there are 5 more recent cases of illness caused by a different type of E. coli 026 among people eating at Chipotle. Food Safety News summarizes the previous Chipotle outbreaks. Seattle: July 2015, 5 people sick from E. coli O157:H7, from unknown food source. 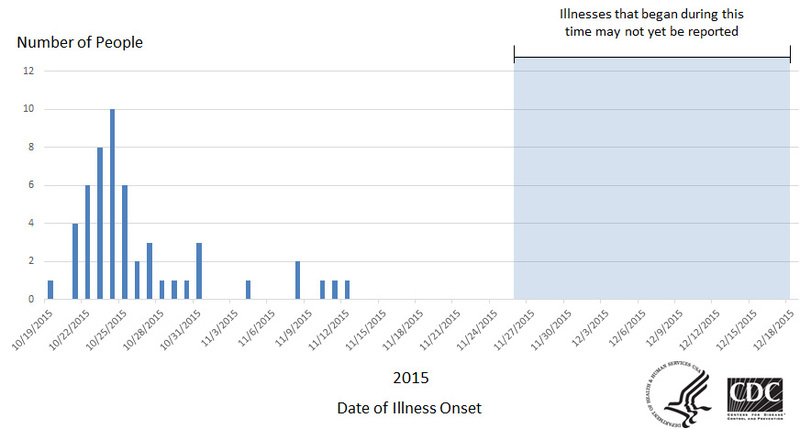 Simi Valley, CA: August 2015, more than 230 sick from norovirus (most likely from an ill worker). Minnesota: August and September 2015, 64 people sick from Salmonella Newport (tomatoes?). Boston: December 2015, at least 136 people sick from norovirus. Nearly 500 people have become ill after eating in a Chipotle since July this year. Stock prices are down 30 percent from a high of $757.77 in August. You don’t need conspiracy theories to explain poorly designed and executed food safety procedures. One of the challenges here has been that we have been able to identify the restaurants where people ate, but because of the way Chipotle does its record-keeping, we have been unable to figure out what food is in common across all those restaurants,” said Dr. Ian Williams, chief of the outbreak response and prevention branch of the C.D.C. That, at least, should be an easy fix. For the rest, Chipotle has initiated a new food safety program, and has recruited a leading food safety expert, Mansour Samadpour, to set it up. I met Samadpour at Earthbound Farms when he was helping that company prevent further problems after the spinach outbreak of 2006. He knows what he his doing. Chipotle needs to follow his advice—in letter and in spirit. It is time to have a culture of food safety added to the “integrity” of the food. I have now learned that bacteria and viruses do not care a whit if my food’s ingredients are organic, sustainable, non-GMO and humanely raised. I am going to hire a vice-president of Food Safety. That person will report directly to me and to the Board of Directors. Like Dave Theno being brought in to address the Jack-in-the-Box crisis of 1993, this person will have the resources and access to decision makers to create a culture of food safety from the top down. The company’s new mantra – “Safe Food with Integrity” – will be completely transparent and shared with all – including our competitors. Will Ells take his advice? I hope so. Yesterday, Food Safety News republished the last of a four-part series in the Portland Oregonian about how Denmark was able to get rid of Salmonella in chickens, but we can’t. [USDA] announced a plan last year to stem Salmonella. Its goal is to reduce illnesses by 25 percent by 2020. The plan, which is still being rolled out, includes a controversial overhaul of inspections, enhanced testing and a first-ever limit on allowed Salmonella in cut-up chicken. Denmark opted for a more comprehensive approach, attacking Salmonella in flocks, poultry barns, animal feed and slaughterhouses. Why can’t we do that too? The U.S. chicken industry is too big. Reforms would cost too much. Chicken would cost more than beef. Nobody–industry, regulators or retailers—wants to bother. The U.S. food safety system is too fractured; no federal agency has the authority to mandate such reforms. USDA food safety authority only starts at the slaughterhouse, not the farm. An impressive number of excuses, no? Better make sure you handle chicken as if it were radioactive and cook it thoroughly. 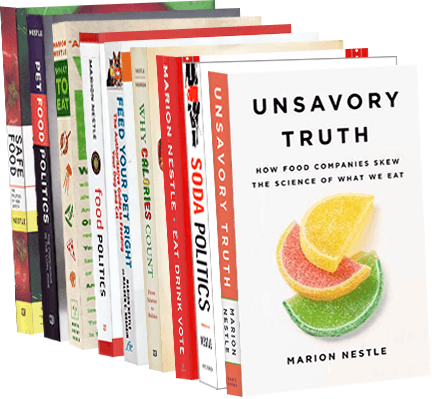 This series is well worth a read if you want to understand what’s wrong with our food safety system. Q: When I read that people are getting sick from salmonella in Foster Farms chicken, I don’t know what to do. Are we supposed to stop eating chicken? A: I share your frustration. Last month, the Department of Agriculture warned that chicken produced by Foster Farms plants in California was linked to illnesses caused by a strain of salmonella Heidelberg which is resistant to multiple antibiotics. Although these antibiotics are not the ones usually used to treat salmonella, antibiotic resistance in general makes bacteria more virulent. The Centers for Disease Control and Prevention now reports 362 people ill with this strain, three-quarters from California, with a shockingly high – 38 percent – rate of hospitalization. And because most food-borne illness is never reported, some estimates suggest that there could be 9,000 cases of chicken-induced illness in California alone. The USDA’s response? It did not require Foster Farms to recall the chicken; it just told the company to clean up its act. According to the USDA, it’s your responsibility to make sure you don’t get sick. You should be following basic household food safety rules, cooking chicken to 165 degrees, and using a food thermometer to make sure. Fine, but shouldn’t chicken be safe before it gets to you? You should not have to run your kitchen like a maximum-security biological laboratory. Besides, cooking chicken to 165 degrees may not be enough. Costco, to its credit, recalled rotisserie – cooked – chickens from its store in South San Francisco when people reported getting sick after eating them. Nobody knows whether the cooking temperature wasn’t high enough or the chickens got cross-contaminated later. Salmonella, alas, is hardly a new problem. In 1971, public health advocates petitioned the USDA to put salmonella warning labels on chicken. But the USDA said no. Salmonella, it said, is an inherent contaminant of raw meat, not an adulterant. The USDA had no need to act. You just needed to learn how to cook chicken properly. In the 1990s, the USDA finally issued better rules for poultry safety. Despite them, the CDC reports a steady rise in salmonella outbreaks and illnesses. The industry responds that the salmonella issue is a complex one because the bacteria are inherent in bird species. Sorry, but salmonella illnesses are preventable. If people are getting sick from eating contaminated chicken, the companies are not following safety rules, and the USDA is not enforcing them. This is about politics, not public health. For decades, advocates have complained about the USDA’s conflicting missions to promote agricultural production and protect consumer health. We have called on Congress to unite federal food safety oversight within one independent agency. Failing that, we insist that the USDA enforce its own rules. The USDA’s recent decision to allow American poultry meat to be shipped to China for processing is hardly reassuring. The mind boggles to think that chickens raised and slaughtered in America would go to China to be turned into chicken nuggets and then come back here to be sold. Also for decades, safety advocates have called for an end to the use of antibiotics as growth promoters in meat and poultry production. Antibiotics not only induce resistance, they induce virulence. Fortunately, the Foster Farms bacteria are still susceptible to the kinds of antibiotics most effective against salmonella, but victims of the next outbreak may not be so lucky. Why do Congress, federal agencies and the White House permit meat and poultry producers to continue reckless use of antibiotics? Chalk this up to industry lobbying and campaign contributions. If you can afford it, buy chicken that has not been factory farmed. Even so, you must cook the meat to a temperature that will kill bacteria, avoid cross-contamination, and sterilize everything the chicken comes near. But the salmonella problem goes way beyond your own kitchen. We all need to press for a food safety system that holds public health as its first priority. This means empowering the USDA to enforce its own rules, uniting the functions of USDA and the Food and Drug Administration, and using antibiotics in meat and poultry production only for therapeutic purposes.